WET weather continued to bug the start of the cricket season last weekend, with many games not able to get under way in the Southern Cricket Association's Twenty20 competition. First, second, fourth and sixth grade matches were all washed out on Saturday, leaving just seventh and eighth grades to see any play over the weekend. In seventh grade on Sunday, New Norfolk III recorded a good 15-run win over the Knights at Pontville. Winning the toss and electing to bat, the Red Caps made the good score of 8/133 off their 20 overs. Young Cody Morgan-Coleman played a handy innings in his team's top score of 32. Cody's innings included three fours and one six. Opener Glen Williams made 21 with four fours, while Nathan Rice made a solid 18 with two boundaries. In reply, the Knights gave it a shake, but fell 15 runs short, finishing 8/133 off 20 overs. Rhys Franklin was the main wicket taker for New Norfolk taking 2-28 (4) and Cody Morgan-Coleman capped of a good day, with fine figures of 1-13 off his 4 overs. In eighth grade, Bothwell II went down to St Anne's by 19 runs at Cadbury's No.1. The home side had first knock making 5/105 off its allotted 20 overs. Mathew Glover was the best of the Bucks bowlers with three wickets. In reply, Bothwell was dismissed for 86 off 18.5 overs. No batting figures were available at the time of writing. 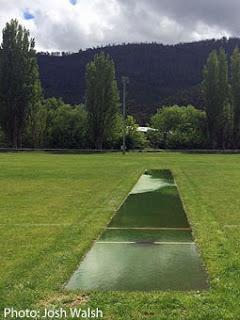 The round one eighth grade clash between Bothwell and Sandford that was washed out was rescheduled and played last Thursday with Bothwell having a big 97-run win. Winning the toss and having first hit, the Bucks made 7/141 off their 20 overs. Young Josh Eyles stepped up making 45. Adam Clark made a handy 27 as did Anthony White with 25 while Joey Eyles made 16. In reply Sandford made just 9/44 off 14.1 overs due to some great bowling by the Bothwell boys. Peter Hansch in a great spell sent down four overs taking 3-7. Joey Eyles had fine figures of 2-0 off 1.1 overs while Mathew Glover 2-9 (3) and Brodie White 2-14 (4) also did their bit. Round 1 of the 50-over matches is scheduled to get under way this weekend and with only 14 rounds to be played let's hope we don't have any more washouts. Perhaps the Twenty20 matches should have been left as they were last season (played during the week)to allow for more rounds of the 50 over format. New Norfolk I v St Anne's at Cadburys No.1. Gretna I v Wellington at Gretna. Molesworth I v Montagu Bay at Geilston Bay. Bothwell I v Bushy Park at Bothwell. Gretna II v Bagdad at Gretna. New Norfolk II v Hobart at Tynwald Park. Molesworth II v Marquis at Boyer Oval. New Norfolk III v Claremont at Abottsfield Park. Bothwell II v Old Beach at Old Beach.